We design and manufacture the HMS434 . 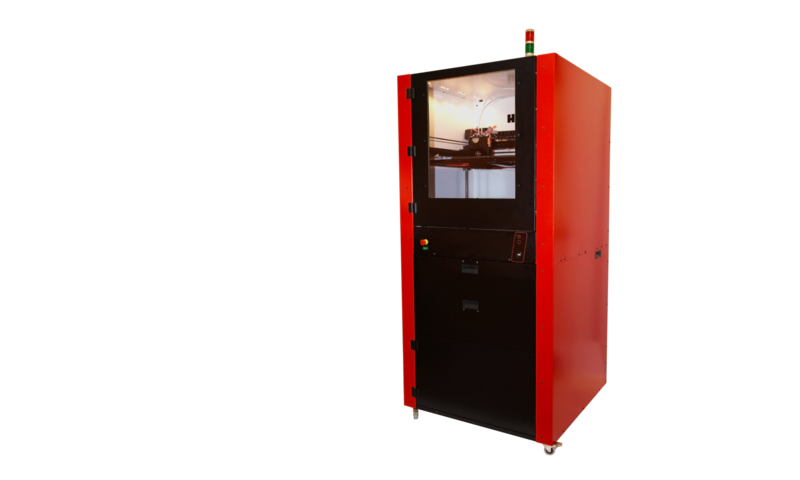 This hybrid AM Machine will cater to all of your 3D printing demands. It is a fused deposition manufacturing machine, which deposits a material that fuses to its previous layer. Because we make a Manufacturing Machine, you are not limited to depositing filaments, but can also print with other materials. The top part of our machine is the heated build chamber. It has a max. build volume of 400x300x400mm. Here 4 tools can make any object that you desire. We have extruders for thermoplastics, TPU`s , elastomers and viscous materials. These extruders can be combined to make 1 multi-material part, or you can parallel print 4 parts at the same time. The parts are made on a heated detachable build plate. All our machines have a dedicated computer with a 22″ touch screen. This connects all our machines to the IoT, but also to each other. This way you can control HMS434 No. 5 from your office, or fromHMS434 No. 2, Or from Tokyo. You decide. The filament storage can hold up to four 2,3Kg rolls (and/or 0,75Kg rolls). It is humidity controlled to ensure your filaments stay dry. It also has a filament watchdog system. This way any unwanted behaviour (like jamming) will be detected on time, and the machine will pause. ThermoPlastic filaments are the standard material to use with our HMS434. As we can add up to 4 different tools at the same time, we can also deposit other materials, in the same part as we are creating with our filaments, or as a new part.